Folding roof installed in Firenze, April 2015. Powder coated thermal insulated aluminium profiles. EPDM gaskets for dry glazing. Motorized functioning with remote controlled equipment. 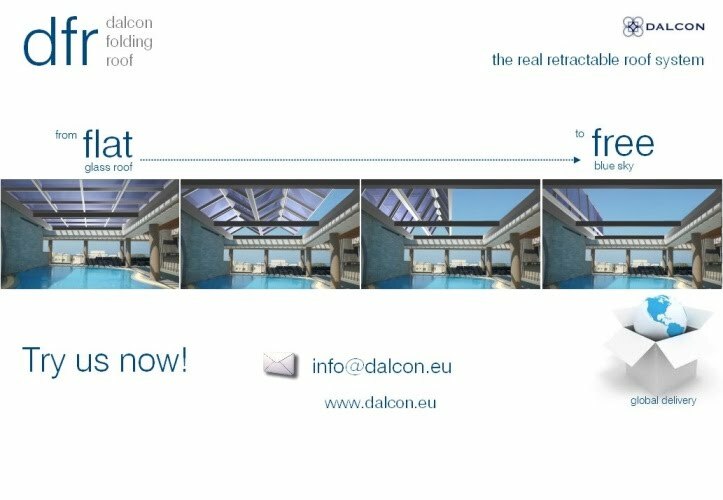 Dalcon presents a unique foldable roof system. DFR brings cutting edge innovation to convertible open air architectural applications . Electrically operated, it uncovers totally the space without remaining parts (beams - railings). Our foldable elements park in the desired side occupying the less space than any other retractable roof system. They can also be totally hidden if a storage point of 20cm per element is available in the parking area. Our thermal insulated and powder coated aluminium profiles combined with translucent covering materials, provide adjustable roofs for spaces that all seasons usage is a functional demand. All of our systems are designed and updated by our R&D department and produced in our own production line, available for global delivery and installation. Contact us now and you can learn the feasibility of your project plans and get started with the budgeting of your project.